In the dining and taxi industries, the ripple effect of China's sharing economy boom has been felt for quite some time, with food delivery and ride-hailing services now all the rage. But the country's logistics market, the world's largest, has not yet felt the benefit of the sharing economy. There are, however, growing signs that the logistics sector is changing and getting stronger, in the intracity courier segment in particular. In a fresh sign, 58 Suyun - the freight business unit of 58 Home, China's largest online bazaar serving local merchants and consumers - announced on Monday in Beijing that it had entered into a merger with GOGOVAN, a van-hailing platform used widely in Southeast Asia. 58 Suyun covers more than 100 cities across the country and over 1 million drivers have signed up with the platform, while GOGOVAN encompasses six countries and regions including Hong Kong, Macao, Singapore and India, and has more than 180,000 drivers signed up, according to the companies. The merger, which will create Asia's largest intracity logistics and freight online platform, indicates an extension of the intracity courier boom that is gaining steam in China's domestic market. It's becoming increasingly obvious that shared logistics services, a comparatively weak link in the country's sharing economy boom, are starting to develop. Other than the convenient availability of Internet-based intracity freight shipping services such as 58 Suyun and Lanxiniu, a number of same-city express parcel delivery startups including Shansong Express and Dada have emerged in the market. The two courier platforms - both of which promise one-hour delivery services for orders within five kilometers - have gathered a growing number of private-hire couriers. Such services broaden the network of established courier firms that rely on their own vehicles and couriers to reach out to consumers. As a consequence, courier services have become ubiquitous in the cities where these shared platforms are up and running. It means that shared logistics services are increasingly sought after, not just by merchants and customers seeking readily available fast delivery services, but also by investors, who are bullish about the outlook for the country's intracity courier market. Official data shows that the country's intracity express delivery volume hit 1.36 billion items in the first three quarters of 2016. The rise of shared logistics and freight services will surely add to the strength of the country's logistics market. Steven Lam, co-founder and CEO of GOGOVAN, said at the event announcing the merger that overseas markets have been much slower than China in terms of building logistics networks. In an indication of the lack of momentum in the US market for on-demand pickups and deliveries, ride-sharing giant Uber announced earlier this year it would scale back its lesser-known courier offshoot UberRush. 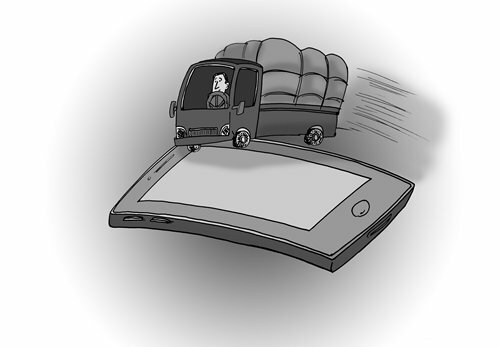 It is noteworthy that there's less hindrance for the development of shared logistics services in China when compared with ride-hailing services, which have found themselves in conflict with established taxi companies. Protests from taxi drivers and firms prompted the government to unveil rules to regulate ride-sharing services, and as a result in cities such as Beijing and Shanghai, private-hire car drivers need a local hukou and car license to be qualified for the job. While there certainly need to be rules to oversee Internet-based logistics and freight services, the lack of competing vested interests should make development of shared logistics services easier. Of course, to ensure safe and reliable logistics services, it is important for the various platforms to invest sufficiently in courier insurance. With the market set to see accelerated growth in the years to come, it is also advisable that the use of vans and trucks should be scrutinized, with industry heavyweights in particular able to take advantage of big data and to cooperate with relevant government bodies to put an intelligent transport monitoring network in place so as to avoid shared logistics services adding to traffic woes. It is expected that these efforts could build the country's logistics sector into a new growth driver for the economy.